Hello all you lovelies! 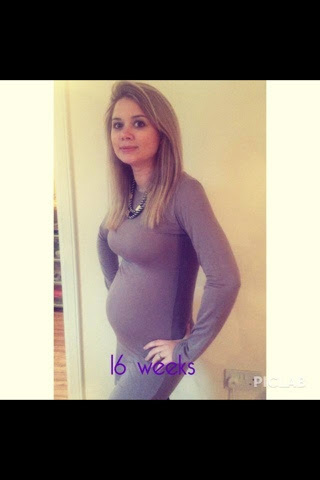 Well this is my 16 week pregnancy update and I have felt very rotten this week! I’ve decided to do a wee template so I can answer the same questions weekly and compare one week to the next! How many days until due date: 163 days!! Weight: 8 stone 4lbs I’ve put on 4lbs! Cravings: diet coke… naughty! Only really allowing myself one every few days! Don’t drink fizzy drinks normally! Movement: feeling baby move now, feels like popcorn going off inside me and also lots of waves of movement that you can see going across bump! Gender: Don’t know yet but I think it’s another girl & have done from the very beginning we find out in 20 days! Sleep: Sleeping ok, I’m so so tired throughout the day but then as soon as I get into bed I struggle to nod off. I have been having some pretty crazy pregnancy dreams too – remember these well from my last pregnancy. Worst moment this week: vomiting all of Sunday night/Sat morning & having to go to my local hospital to find out I had food poisoning & a kidney infect & now also have what appears to be a throat infection!!! My immune system is clearly down and I just seem to be getting ill very easily! Poor me! Best moment this week: spending the day with good friends that are back vising from Australia! Labour signs: thankfully not… although I have had a few braxton hicks which I didn’t get until much later on with Safiyah. Happy or moody most of the time: a bit of both, trying to remaing happy & upbeat for Safiyah’s sake but feeling pretty miserable! Looking forward to: Finding out the babies gender and having a little gender/easter/birthday party with some of our friends.